The art pieces can remain displayed for a few weeks. They can also be displayed in the school lobby, school library, community library or local community center. The teacher may wish to sponsor a class-wide, school-wide, board-wide or community-wide art contest using the above lesson plan as a basis. 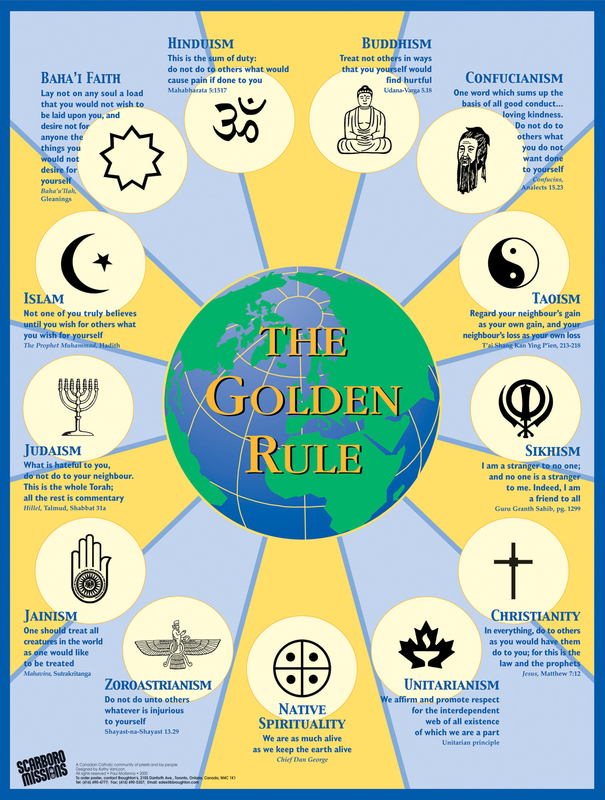 In 2006, Scarboro Missions sponsored a Golden Rule Art Contest for young people that attracted submissions from around the world. For those interested in learning more about this contest, see the Resources section below. The teacher, community, youth group or school may wish to invite a number of students to work cooperatively to create a mural that features the themes developed in the above lesson plan/exercise. Students may wish to create a song, rap, skit, dance or flag that features the themes developed in the above lesson plan/exercise. 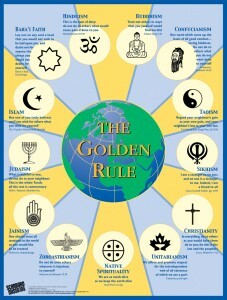 If the teacher wishes to conduct this art exercise with a specific focus on ecological issues, she/he can consult the Green Rule Poster which features ecological teachings in 14 spiritual traditions. Accordingly, the students would be invited to “Imagine what the world would be like if every person on the planet made a special effort to protect and care for our environment.” For more information about the Green Rule Poster, see the Resources section below.